PEARL! I looove pearl. Is it a gemstone? I am not sure where to group pearl. Over here in Malaysia or at least in Kuching, when you say you like pearl, it is always associated with the older generation…..older women in their 50’s and above like to wear them. But I am in a younger age group…hahaha. I read somewhere that pearl helps us get in touch with the simple honest things of life. It inspires purity, honesty, innocence, integrity, concentration, focus, serenity and tranquillity. For the last few months I have been collecting (buying, actually) strands of pearls…mostly freshwater pearl of different colors, shapes and sizes. In my mind I have been wire wrapping a lot of necklaces, bracelets and earrings with them but, it is only in my imagination…..haven’t got the time….hmmmm!! So far, I have wire wrapped few pieces of pearl jewelry. 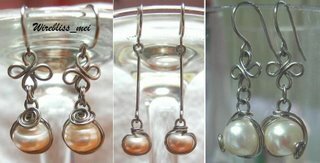 Here are three of the earrings I wrapped with stainless steel wire. If you ask why the wrapping is all similar, well first of all, these pearls all come with holes drilled halfway into the center only. As such, I hv to wrap the wire around the pearl to secure it in place. Otherwise, they’ll come off easily. Secondly, I don’t want to use glue so that I can detach them easily.